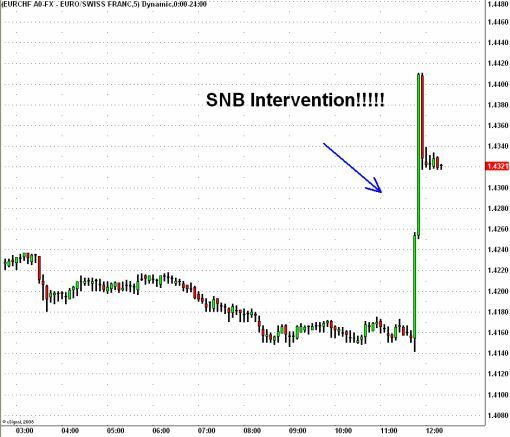 SNB Intervenes in the Swiss Franc! Last week we raised the question of what the Swiss National Bank is waiting for and why they haven’t intervened. In that article we said “Everyone has an uncle point and for the SNB there is no question that we are nearing that level…” At that time, EUR/CHF was trading at 1.4272 and apparently today’s record low of 1.4144 was all the SNB could handle! They have denied to comment on the move in the Swiss Franc but a 265 pip rally EUR/CHF in under 6 minutes is exactly the type of move that only occurs when there is intervention. Most likely, the SNB had their buy orders sitting were right below 1.4150. Judging from the price action in EUR/CHF after interventions last year, the rally will probably not last particularly since the central bank is talking about raising interest rates.